Writing for the Ear – with Humor: Did you hear what they said? 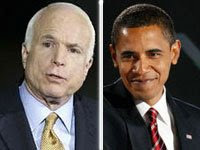 Obama was gracious in victory as was McCain in defeat, but I was struck by what each said toward the end of his remarks. Clearly speaking to anyone who suspects his leadership vs terrorism, Obama declared, "To those who would tear this world down – we will defeat you. To those who seek peace and security – we support you." Likewise, I think McCain was speaking not only to his hard-working supporters but to the next administration and to the world when he said, "Americans never quit. We never surrender. We never hide from history. We make history." As I said, the statements came near the end of both addresses where speakers are wise to make the points they really want the audience to retain. You're right--I do remember them both ending that way. Good point. Thanks, John ... but I should have added that both statements, particularly McCain's, may reveal a US trait that has become painfully overbearing in recent years. That trait is arrogance. So when Obama says "we will defeat" those who would "tear this world down," I hope he means, by "we," not just an all-powerful America but all right-thinking peoples and nations. And when McCain says, "We never quit. We never surrender," it doesn't mean that we shouldn't change a disastrous strategy in order to win an ultimate victory. This is a man, after all, who himself once had to surrender, but who survived to fight another day. I think the arrogance quotient in the Oval Office is due for a downward adjustment in coming weeks. Not all the way down to zero, mind you, but at least lower than it's been. At least Obama's people are unlikely to assert, as a Bush aide did once famously observe to a reporter, that "we're an empire now, and when we act, we create our own reality."